« Lay People call Pastors and other Rostered Leaders. What Are You Doing to Get Ready? 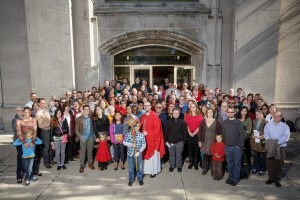 This photo is of the people of St. Luke’s Lutheran Church of Logan Square, gathered outside the sanctuary on their last day of worship there. (Read more about the story behind this photo here). There is something great about them. St. Luke’s recently made the difficult and courageous decision to sell this building and invest in their future ministry and presence in the Logan Square neighborhood. Eleven years ago, in late fall of 2004, the ELCA told the pastor in the middle of the photo (Pastor Erik Christensen) that he couldn’t be ordained in the ELCA because he was gay. About that same time, the ELCA denied the congregation’s application to be a redevelopment site because they lacked the sufficient resources (human and financial). In the spring of 2005, many congregations received a postcard inviting them to consider candidates from the Extraordinary Roster. One of those folks, Erik Christensen had entered the extraordinary candidacy process after he was denied approval by the ELCA because he was gay. St. Luke’s took the extraordinary steps to call and ordain Erik Christensen outside of the ordinary process of the ELCA. Then Extraordinary Lutheran Ministries (through our former Ministry Grants program) invested financially for 5 years in this congregation while they started to rebuild. And clearly – rebuild they did! 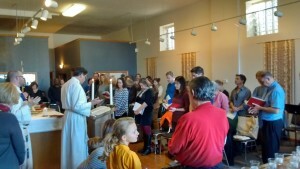 St. Luke’s Lutheran of Logan Square in new worship space. From the beginning congregations and lay leaders have stepped up to affirm and support the calls of LGBTQ people. Extraordinary Lutheran Ministries – thanks to the generous investment of our supporters – has provided consistent outreach to candidates and congregations to find ways to do ministry and proclaim the Gospel. So, what is the “one” great thing about St. Luke’s? Well, of course the truth is that there are many of them. 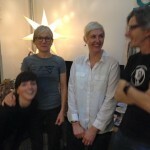 One that is present for me as I write this is exactly what you see in the photo: community. The community of St. Luke’s trusted in God and called Erik. Erik was surrounded by the community of Extraordinary Lutheran Ministries. And you make up the community that is Extraordinary Lutheran Ministries. Which means YOU are another great thing about St. Luke’s! And you are one great thing about the other congregations looking for leaders – and the leaders looking for ways to live our their call to ministry. You make this support a reality. Well, what are the 10,000 other things then? If you have read this far, I know that you truly care about these leaders and this ministry. So first, thank you. Second – we need you. We are close to the end of the year and we are working very hard to make sure this ministry is fully funded as we wrap up 2015 and move into 2016. I want to share a sneak peek with you about some very important news you’ll hear more about soon – we have received a one-time $10,000 matching gift for new, increased, and renewed gifts. If you are thinking about making your first gift to ELM – or increasing from last year – or if you haven’t given in at least a year and want to give again – NOW IS THE TIME! Between now and Dec 31 (only! ), every dollar you give will be matched by an extraordinary supporter. This friend will give up to $10,000 – but only if you give. The community of Proclaim has grown by 25% in the last year – ELM needs these resources to keep up with that growth. Each dollar will help provide the kind of support to the future LGBTQ leaders of our church that we have given to present leaders like Pastor Erik. You are the reason we are able to support LGBTQ people in ministry. Thank you for your wonderful year-end contribution. Amalia Vagts doesn’t always burn the midnight oil to finish her blog posts. But when she does, she’s happy to do it in New York City, at the end of a few busy days of GREAT visits with wonderful ELM friends. And occasionally she finds time for other things on her trips too, like tonight’s marvelous reunion dinner in Brooklyn with her German host family from a semester abroad in 1994. This entry was posted on Wednesday, December 9th, 2015 at 5:15 am	and is filed under Blog. You can follow any responses to this entry through the RSS 2.0 feed. Both comments and pings are currently closed.